the final time in this 1970 bonbon which, following the infamous commercial failure of Tati's previous feature, the sprawling and costly Playtime, had to wait years before being shown in the USA. It was America's loss. I'd not only blame the bottom-line accountants of Hollywood but also the critics of the era who seemed to find M*A*S*H the alpha and omega of achievements in comedy and Tati no longer relevant. Spurt that artery! Disrobe that Hot Lips! Scream those swear words! Poor Tati was just too innocent for those National Lampoon-Mel Brooks days. Less heralded than most of Tati's handful of features, Traffic is an unrecognized delight, and I think it stands up very well today indeed, I don't care if Bush strongholds in this blighted Buckeye State wasteland still serve "freedom fries" and round up French poodles for waterb oarding torture at Gitmo or not. Inventor Hulot here works for a small automotive start-up company, and he has designed a sort of cozy little mini-van that unfolds every single single panel and light fixture into full-scale luxury recreational vehicle and campground tent. It's a great bit and must be seen to be believed. 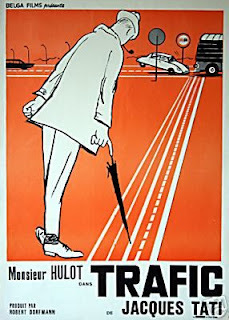 Hulot must get the bizarre car to an auto show in Holland on time, but accidents intervene, stranding him in a little village along with a pretty, cosmopolitan mademoiselle, which turns out to be one of Hulot's more successful dating experiences, in the end. The narrative is almost completely non-verbal, and it's a hoot, including the most hilarious routine ever to concern roadkill. Under the humor and pratfalls it's thematically consistent with the rest of Tati's Hulot comedies, gently contrasting the hapless but well-meaning hero and his silly gizmo with the big-business attitudes of the mainstream car giants, and, by extension, the modern society Hulot can never quite catch up with. Tati seems at a bit of a loss at how to end the picture - which is quite short by his standards - but it's still clever. Pity that more people, especially kids, have seen RV or any given Herbie the Love Bug adventure, than Traffic (or think the title refers to a world-girdling drama about the international drug trade). It's a fun, sporty little ride that gets more mileage per setup than a lot of comedies. 3 1/2 out of 4 stars. OK, ok, you sold me. I'll watch a Tati flick. Geesh.